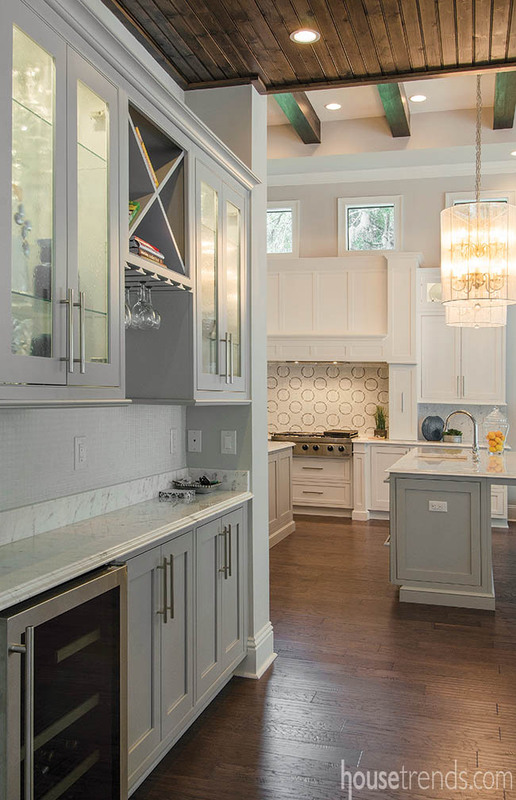 These circular pendant lighting fixtures are an eye-catching touch to this kitchen. 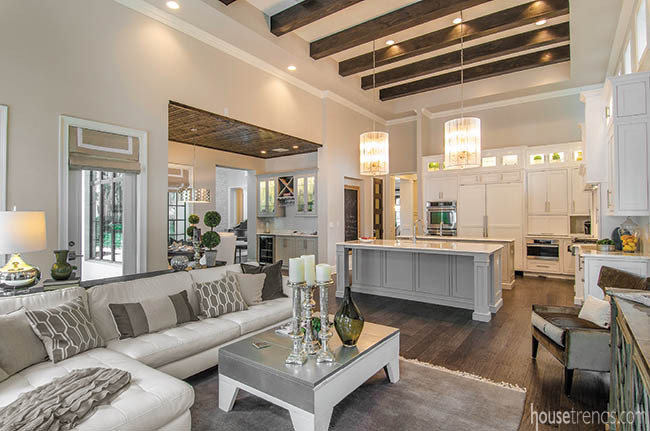 Serenity…that is the feeling you get when walking into Peggy and Allen Carman’s elegant new home situated on a quiet, wooded lot in Fishhawk Ranch. Although Peggy runs her own business, her second full-time job was in the design and decoration of her home. 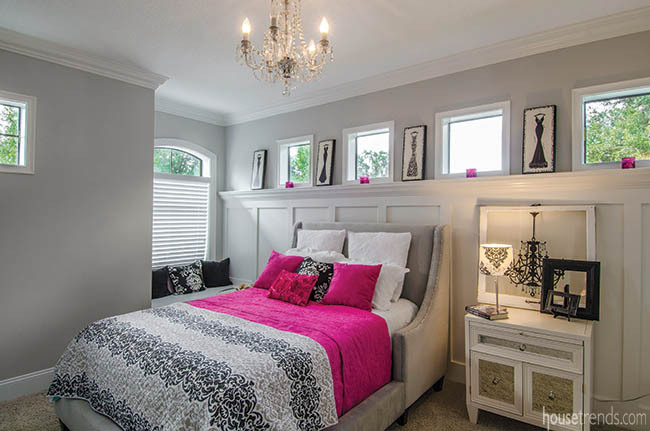 Between scouring the smaller home design shops in South Tampa and working with Trudy Waterworth from Annabelle’s Fine Home Furnishings in Oldsmar, Peggy was able to fully decorate and furnish the home. Lighting was a key element to the interior design of the home. 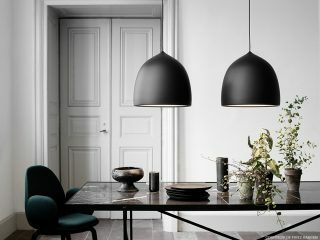 Many of the rooms feature dramatic, circular pendant lights that really pop. “To me, lighting is very important. It sets the house apart with the design. The lighting we chose is more on the modern side to give it that edge,” Waterworth says. Building a new home always has its challenges and one of these challenges showed up on the stone wall portion of the project. 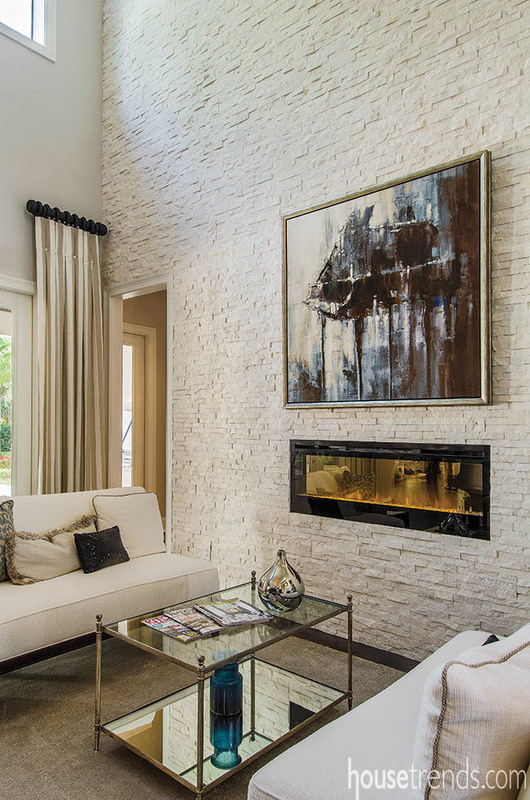 The original gas fireplace chosen to accent the stone wall proved to be too deep for the space available. Scrambling for a solution, Peggy and Allen found a sleek, black electric fireplace, which creates the optical illusion of flames over a bed of glass chips and suits the space perfectly. 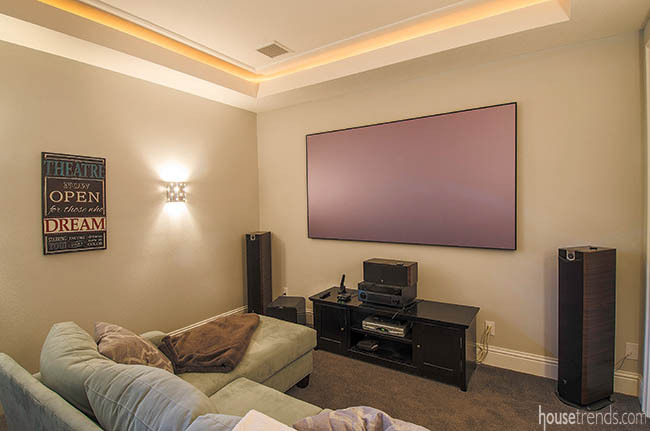 The trim work in this house is used to dramatic effect. 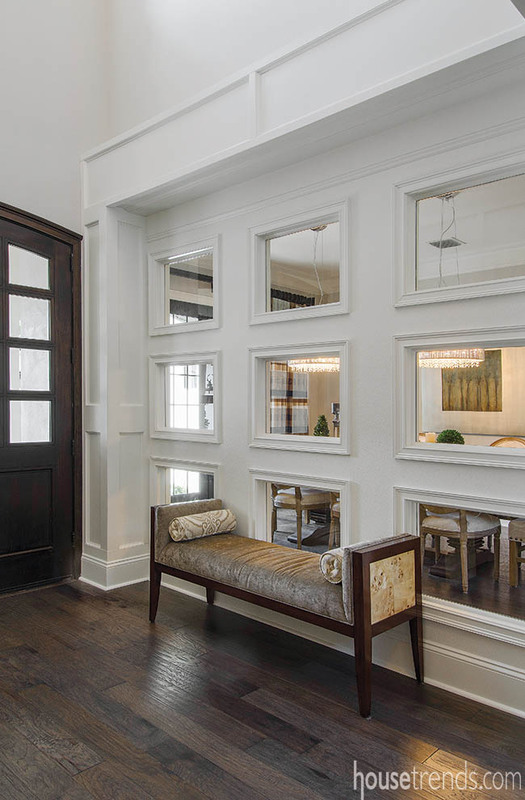 In the foyer, instead of using columns to visually separate the dining room from the entry as often seen in new homes, this dining room features a wall with nine matching glass windows carefully framed out in elegant trim. 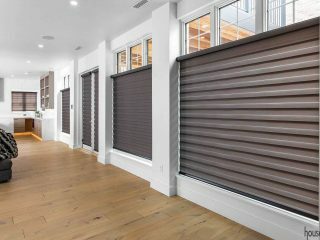 This unique design allows light to flow and creates a visual connection with the room while still giving a sense of separation. 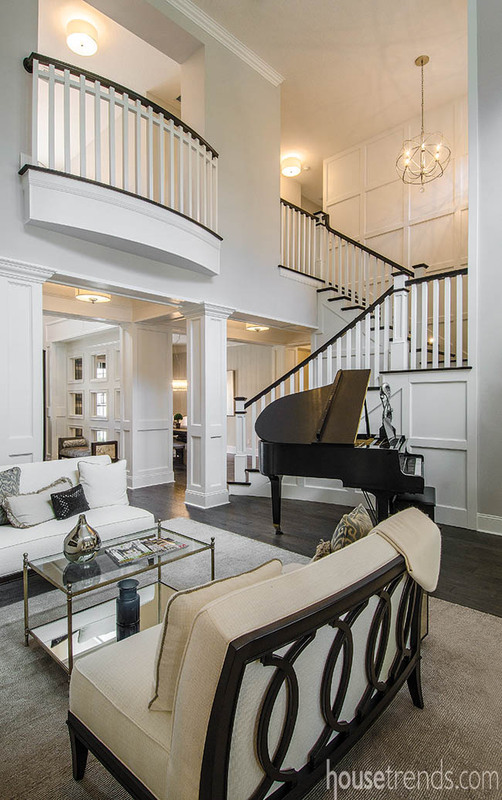 White wood boxed paneling rises up the staircase walls, tying in with the wooden banister and giving it a rich, classic effect. 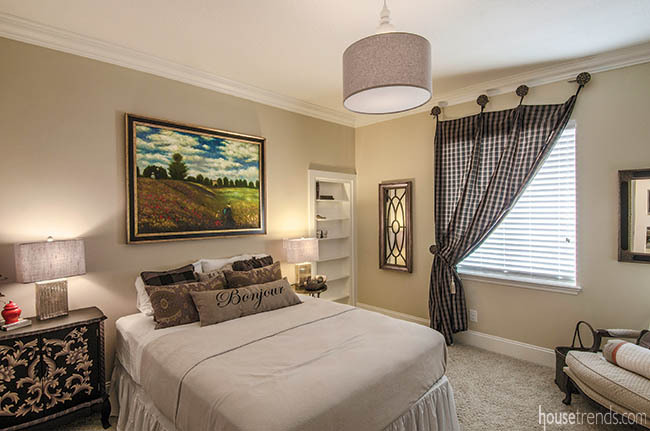 The master suite is truly a soothing retreat. Here, Peggy’s hand can clearly be seen. 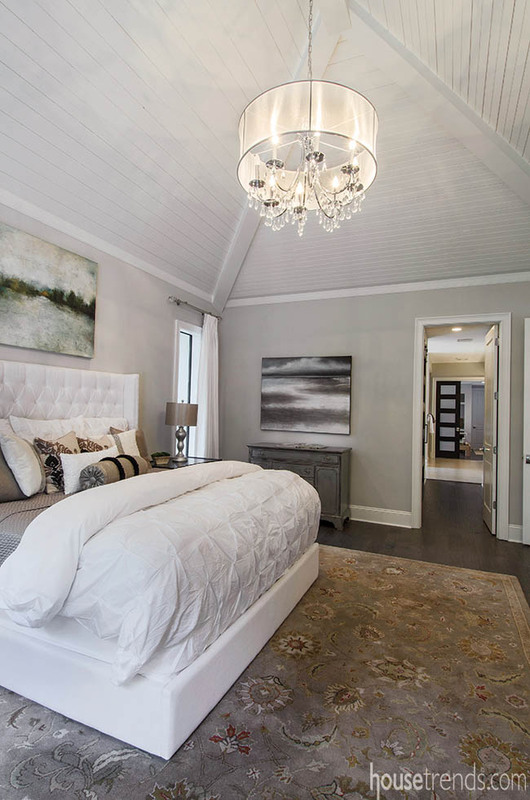 A soaring coffered wooden ceiling painted a cool white crowns the spacious master bedroom. White linens and furniture paired up with ethereal paintings by a local artist keep the space serene. 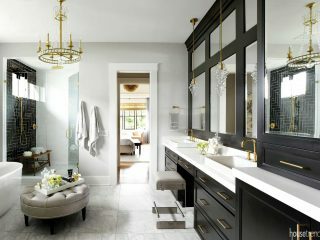 En route to the bathroom, large walk-in closets are closed off by sliding “barn door” style doors comprised of dark wood with smoked glass. 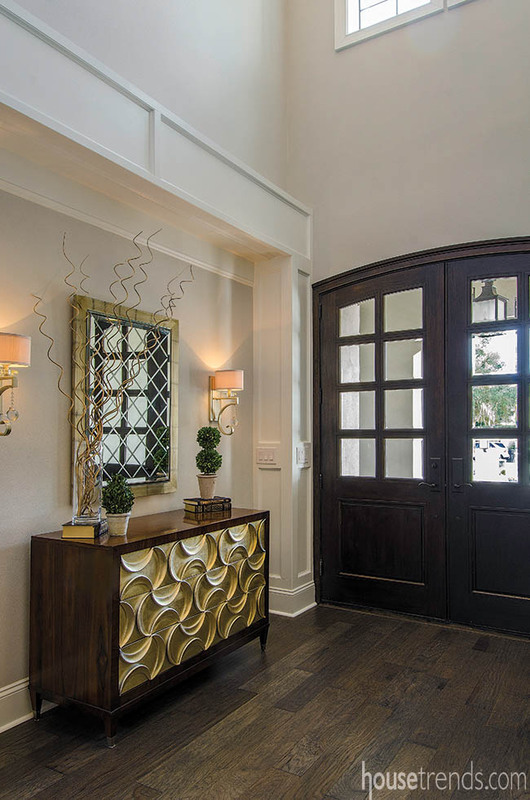 Peggy found these doors, which are also used elsewhere in the home, on the internet and breathed a sigh of relief when they arrived and were as great looking in person as they looked online. 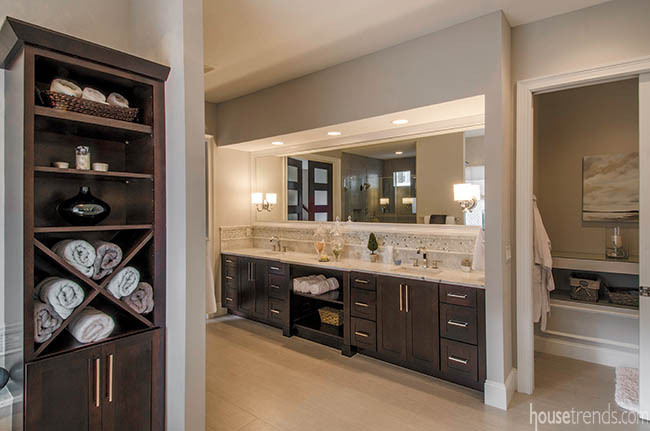 “For the bathroom, we really wanted it to feel like a spa,” Peggy says. 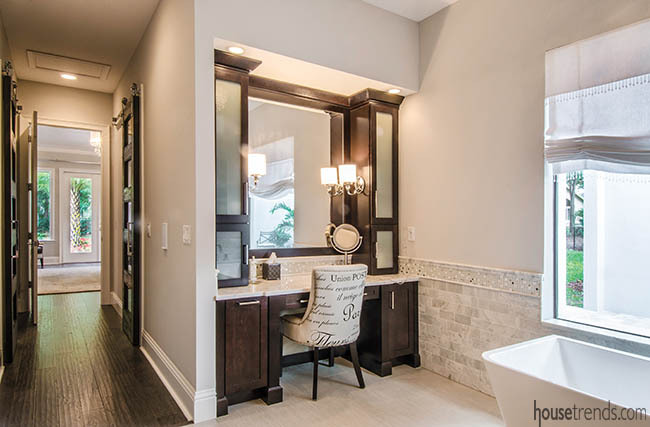 Dark wood cabinetry accented by white stone countertops sets the tone. 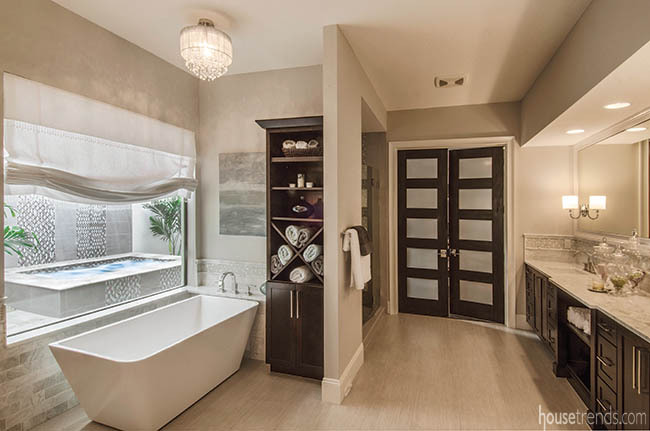 Natural light pours in through a large window above the pristine white soaking tub. 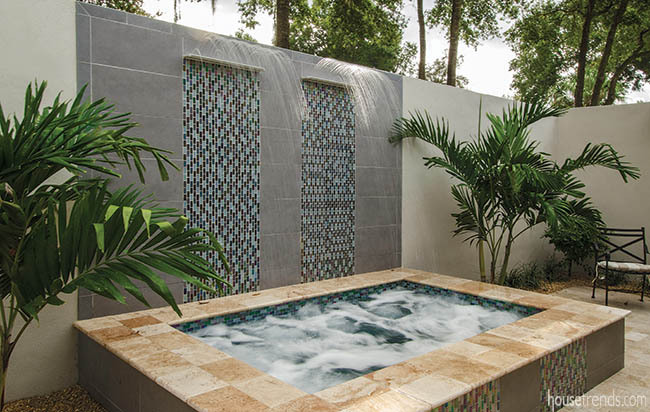 Outside, an enclosed courtyard features a bubbling hot tub; the tiled waterfall backdrop enhances the spa-like ambiance. 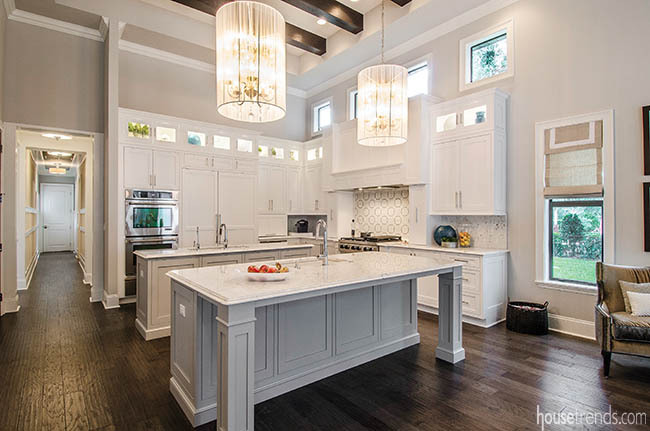 In keeping with the clean style of the home, the kitchen features white custom cabinetry and white marble countertops. 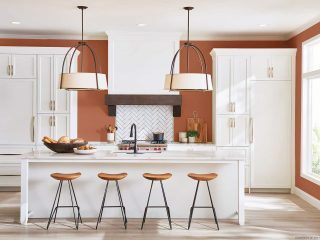 “Marble takes more effort to maintain but when we looked at quartz for the counters, it just didn’t have the same richness to the stone,” Allen says. This kitchen has the latest in technology including a Miele steam oven, and Peggy’s favorite appliance, the dual Jenn-Air computerized ovens which seem to do nearly everything except wash the dishes for you. 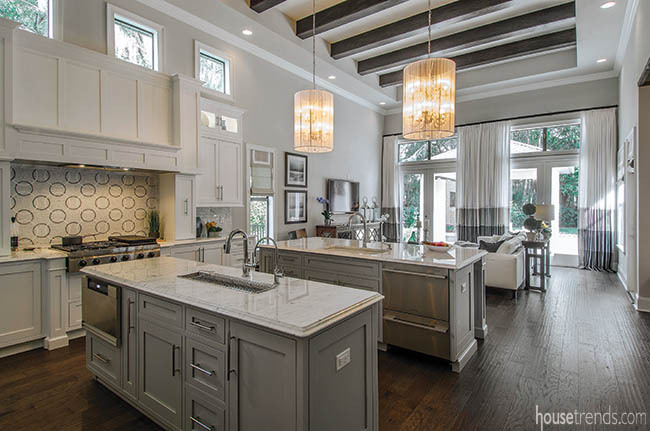 A narrow vegetable sink in one of the two kitchen islands includes a faucet for pre-chilled, filtered water. The Dacor six burner cooktop is backed by an elegant gray and white marble tile mosaic. This home also features a home office and craft room on the main floor, and three bedrooms and bathrooms plus Peggy’s home office upstairs. Outside, the home is situated around the crisp, clean lines of a rectangle-shaped pool with a tiled fountain wall and three stepping platforms. 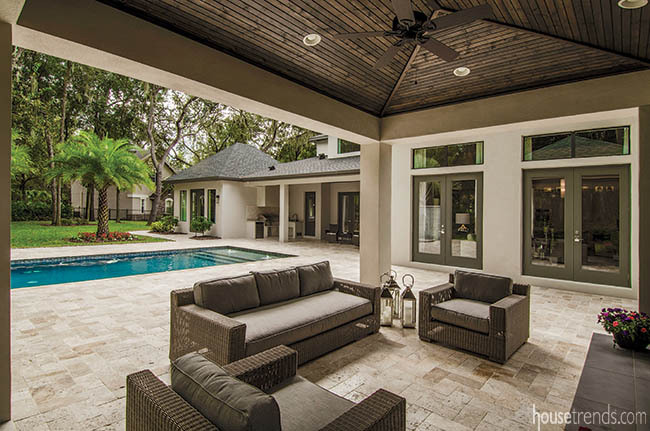 The spacious deck area also features an outdoor kitchen and a separate outdoor cabana room complete with built-in fireplace, television and comfortable couches. 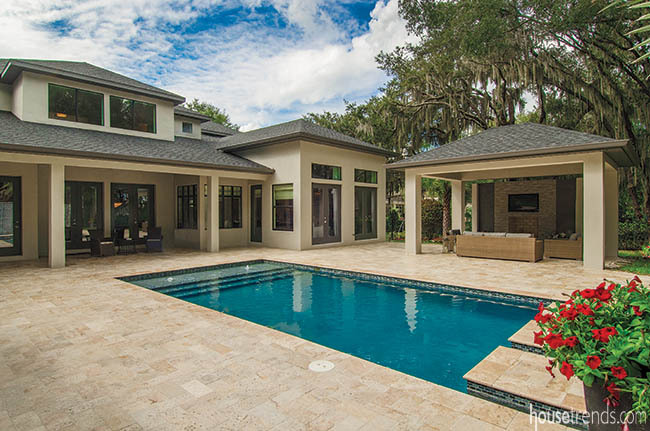 The couple says they couldn’t be happier with their new home, which has evolved into a truly restful retreat that showcases their own unique styles and personalities.